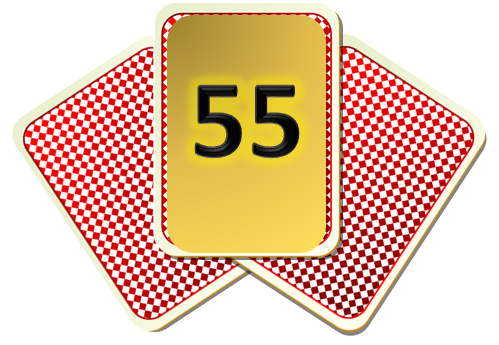 There are 3 cards, or 3 numbers, one of them is known to us as 55. The sum of the cards, two numbers at a time is 70, 85 and 95. Let the numbers be A, B and C.
So, A+B = 70, B+C = 85 and C+A = 95. Let us assume that C = 55 for now. If C = 55, then B + C = B + 55 = 85, which means that B = 85 - 55 = 30. If C = 55, then C + A = 55 + A = 95, which means that A = 95 - 55 = 40. We can see that A + B is then 40 + 30 = 70 which is already given. So, A, B and C must be 40, 30 and 55. Therefore, the difference of the highest and lowest number on these 3 cards is 55 - 30 = 25.